Where do I start with my story? I wish I really knew. I don't know when I started to react to gluten. It might have been in my childhood. I suffered from severe childhood migraines (both abdominal and cranial) and eliminating foods that contain Tyramine really helped. But I still suffered a lot of health problems from that point on. I got sick easily and it lasted longer. I suffered severely from allergies and never could seem to get them under control. In fact they just seemed to get worse and multiply. During my teenage years I was sick often and the weight just never seemed to leave. My stomach problems got worse. I worked hard to lose weight on and off through those years.I felt bloated and sick to my stomach often - and now looking back and can see the things that bothered me most. Every friday night we had home-made pizza. One of my personal favorites. But most friday nights after dinner I would be getting ready to go out. That's when my stomach would start going crazy. What I then chalked up to a nervous stomach (because I was a teenage girl about to go to a dance) was actually the wheat starting to bother me. Then it got really crazy. I started gaining more weight and being sick to my stomach all of the time. I was tired all of the time. My Mom read about stomach bacteria and yeast (Candida) and we decided to go on the Candida Diet. I'm not talking a simple version but a full-on overwhelming version of it: no sugar, no dairy, no carbohydrates and no protein for the first few weeks. Then you slowly add in protein without seasoning, then rice, then a few other things. I lost a lot of weight on that diet and was on it for almost a year. I was SO healthy though. Full of energy and so happy. It was by far the best thing I could have done. But it was SO HARD to do. Especially at 20 years old when you're going out with friends a lot. Then came my mission. I went to Argentina as a missionary for my church. I was there for a year and a half. Believe me - I gained a LOT of weight and was sick a lot. It wasn't that surprising considering I was eating pasta, pizza, empanadas, helado (ice cream), amazing yogurt, and alfajores! Looking back the Celiac in me freaks out at what I ate and misses it too. The Dr. there helped me through some of the problems, had me do a cleanse, then eat "whole foods". It helped, but going from white bread to whole wheat breads didn't eliminate the problem. After my mission I tried to go back to the Candida version of eating. I exercised a lot, I got my weight down, but still struggled with my health. Then I got married and started having even worse stomach problems. I had my first son. I gained a lot of weight during that pregnancy and suffered from postpartum depression. Over the next eight months I was very sick. I had a root canal that caused immense facial pain. When my son was 8.5 months old I ended up in the hospital having a emergency cholecystectomy (Gall Bladder surgery). I also suffered from pelvic girdle pain postpartum. It went undiagnosed for almost a year and made it extremely difficult to exercise let alone walk. I sometimes collapsed while going up the stairs from the sheer pain. It was SO frustrating. After finding out about the pelvic girdle pain (which took finding a new Dr. who wasn't content to just push pills as a solution) I was finally able to exercise more and lose some of the weight. Then I had son #2. Then the Dr. that I was making progress with moved. So I found a new one. I gained a healthy amount of weight that pregnancy but I was exhausted ALL of the time. Then, after giving birth I had postpartum elation. It was great while it lasted but then I started to get really sick. I gained more and more weight, my anemia got worse, and my Dr. kept just trying to convince me to do Weight Watchers. I tried. That and several other diet programs. But none of them made me feel better and none of them stopped the swelling, bloating and cramping. I NEEDED health, I needed to get better. But it just wasn't happening. If I asked for a thyroid test my Dr. would roll her eyes (even though I was on Thyroid medicine before). I started to get more frustrated with myself and really felt helpless. I went in for an unrelated test to find out if I had a gene (CYP2D6) that causes adverse reactions to morphine and codeine. My Mom and some of her family have horrible reactions to it and I wanted answers. (My Mom and I have very similar health issues.) After being yelled at for a few minutes because she'd never heard of this, it might cost a lot of money, and why did I even need to know and so on she left her office to find out more. By then I know she had decided I was a hypochondriac - she as much as said so in her yelling. Well she later came back into the office and informed me she'd order the test, it was covered, handed me the request and told me I could go take it downstairs. Not one apology, but a hint of shame. That was the last time I saw her. Can you see how depressing this must have been? After years of "irritable bowel syndrome" to still not know what food was causing the problem? Suffering from anemia, deficient in Vitamin D, B, etc. Unable to properly absorb the healthy nutrients I was trying to eat? I was sick. Very sick. Of course, because I was overweight there was no chance that I had Celiac disease. That just wasn't on my radar at all. Along the way I have been diagnosed with: various allergies, irritable bowel syndrome, thyroid related problems, sleep appnea, severa anemia, lack of exercise, and suffered a lot emotionally. It has been a long, and many times lonely road. Not feeling like I could trust my Dr. to help me made it even worse. By this time it was getting worse. I was suffering from SEVERE abdominal pain and had no energy. I was napping more than I had during my pregnancies. I was SO TIRED and it wasn't the kind of tired I could just blame on my two energetic toddlers. I wasn't alone, and I had tons of support and wonderful friends. One of whom encouraged me to look into Functional Medicine. I was looking for a Naturopath at the time - thinking that maybe I could find answers with someone in that field of medicine. But I decided to learn more about Functional medicine and I'm glad I did. I love my new Dr! She is kind, patient, listens, and most importantly wouldn't prescribe pain medicine to solve problems temporarily. The whole theory behind functional medicine is to get to the root of the problem. And that she did. After allergy tests, blood test and much more she recommended I try going off Wheat and start taking Iron, Vitamin D, etc... to start the healing process. She ran more tests and I slowly started to feel better. Then I started to notice how rarely I had abdominal pain. Several months later I started hearing more about Celiac disease. A few people around me have it and it seemed like there were more posts to social media about it. Was this something I could have? I doubted it. I was extremely overweight, not underweight. But as I talked about it with a friend who did have Celiac disease she shared that several of her relatives were overweight when diagnosed. Last December I finally got my answer. When I asked my Dr. to test me she was more than willing. She prepped me for the possibility that it wasn't the answer, but said it could very much be a possibility. Then I got the results. I have Celiac disease. I sat there in shock. I have to confess I was REALLY SURPRISED. Years of being tested for who knows what and all tests coming back negative had prepared me for more negatives. I think I may have cried. Then I felt overwhelmed. Could I do this? I finally had my answer - the one I'd been searching for, waiting for, praying for. Celiac disease doesn't come with a pill, or a cure - only basic instructions: stay away from gluten! But that is only part of the picture. There's actually more to it. At what point did I became Celiac? Or did I always suffer from it? Was it first an allergy that morphed into the disease? Will I ever know? Probably not. But one thing remains the same. I have Celiac disease and now I know about it I have hope. Hope for better health, hope for a life not spent wondering where the nearest bathroom is, hope to prevent more issues related to this disease! 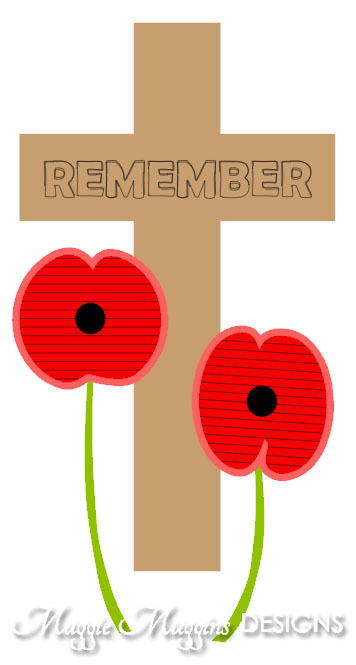 Crosses and Poppies are both frequently used symbols for Canadians as we remember our Veterans on Remembrance Day each year. Crosses mark the graves of the many who gave their lives for our freedom. Poppies were the first flowers to grow on those graves. They were first noted in Col. McCrae's poem In Flanders Feild. Both symbols remind us of the cost, remind us to protect our freedoms and to seek peaceful options in order to prevent war again. This file is FREE for Personal Use only to make a scrapbook layout, cards, or other memorial items. Each object is grouped and will have to be ungrouped for layered cuts. Remember to set cut objects to not cut when sketching or they will be drawn. Also remember to move sketch files out of the cut area or, set them to not cut when actually cutting! FREE FOR PERSONAL USE ONLY- By downloading this file you agree to the following terms: This file is for use in your own creative projects; not for commercial use. Please do not sell or offer these downloads as your own creations. Please do not distribute these files to others, but refer others here to download for themselves instead - these files are given freely for download from my site only. Thanks for your understanding! 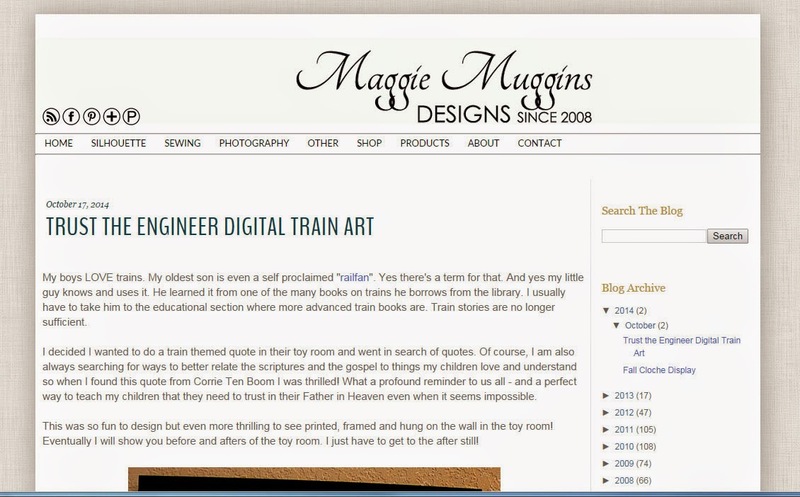 Your own designs created with these files may be submitted to magazines, contests and Internet galleries, with proper credit given to Maggie Muggins Designs. If you have questions about the use of a file please contact me through email. 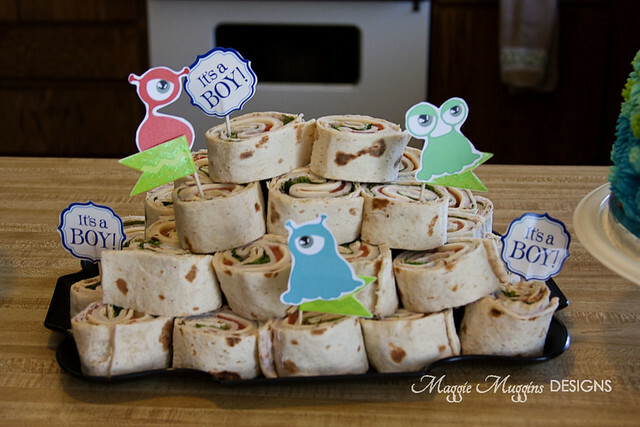 Earlier this year I hosted a baby shower for a girl in my church congregation. She was about to have her first little baby. 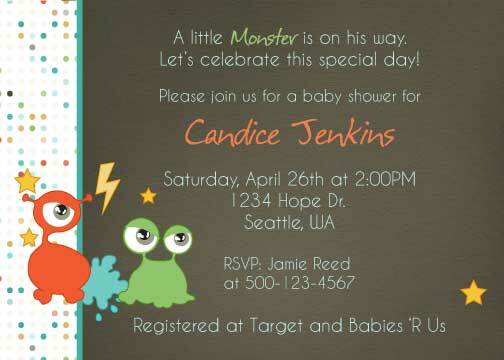 Her nursery was going to be Monster themed for her new little boy so I decided to use that theme for the shower. 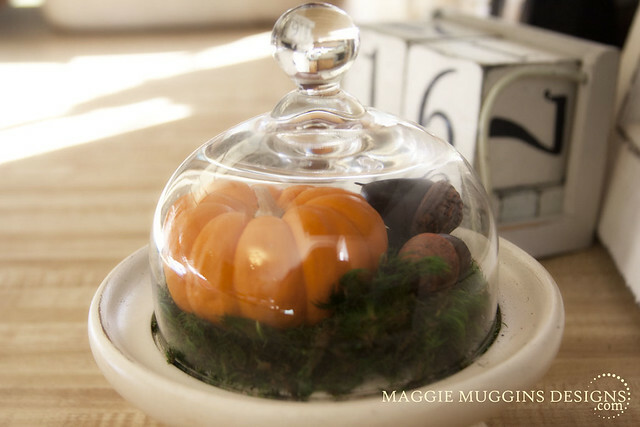 This would be a perfect theme for a shower around Halloween. 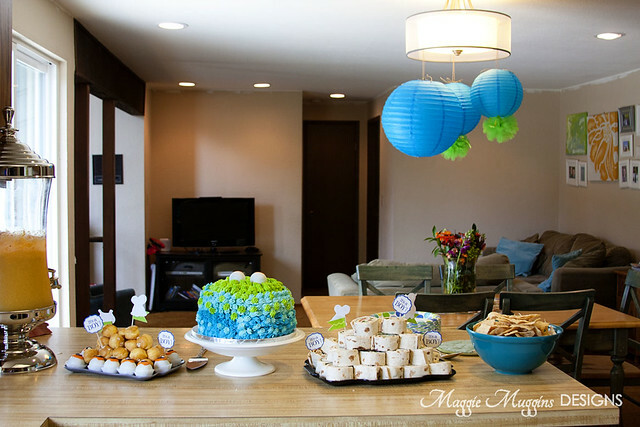 I kept the decorations simple with blue, orange and green as my colors. Some lanterns, poufs, and flowers were the main decorations. 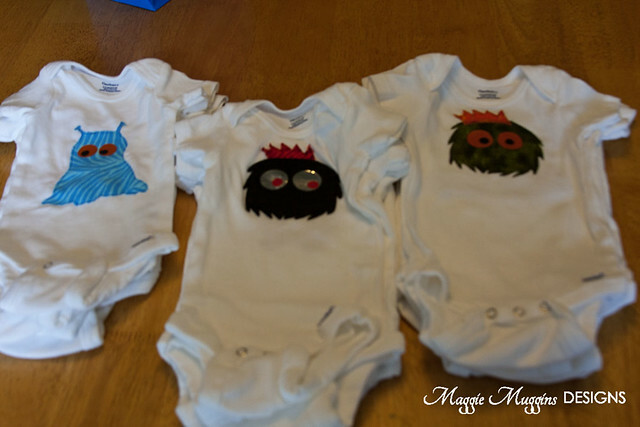 Then I tossed in a few little monsters here and there in the food. 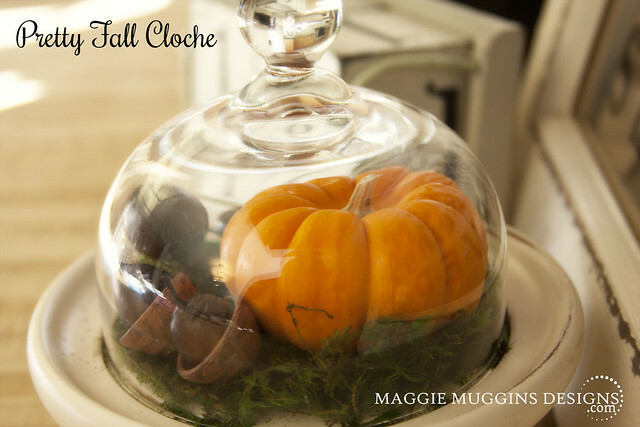 You really don't need too many decorations when your cake takes the show! 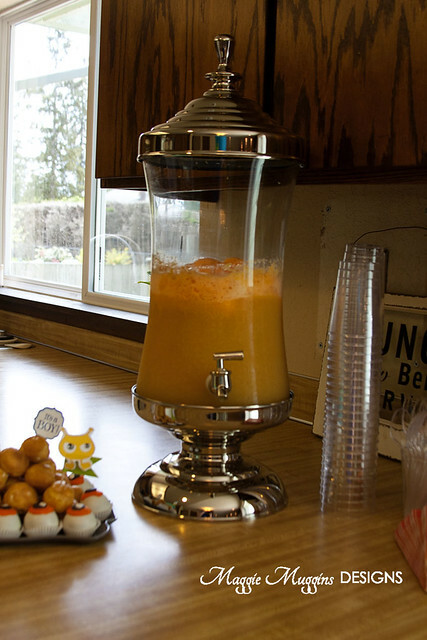 Turkey Wrap Sandwiches, Spinach Artichoke Dip, Fruit, Veggies, Cream Puffs, and a delicious Orange-Pineapple Sorbet Punch. 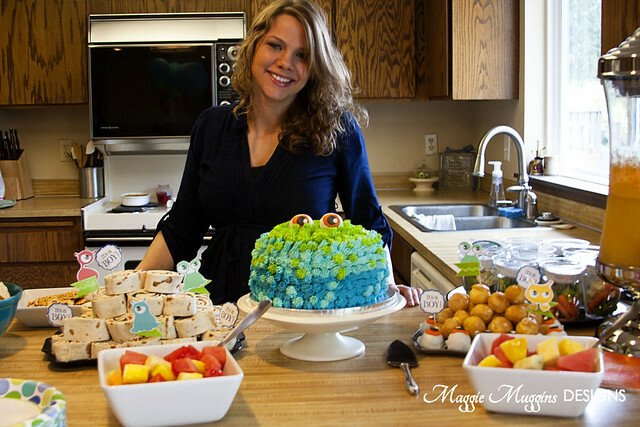 Much Thanks to Emerald City Cake Ball for this gorgeous Monster Cake! 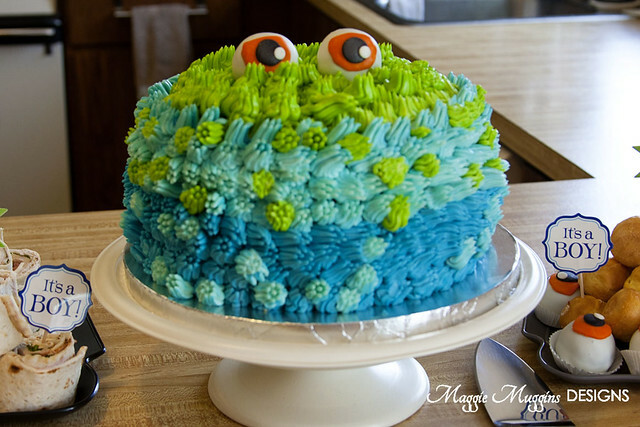 This was my suggestion for the cake but I told her I wanted it to have more blue and green not orange. 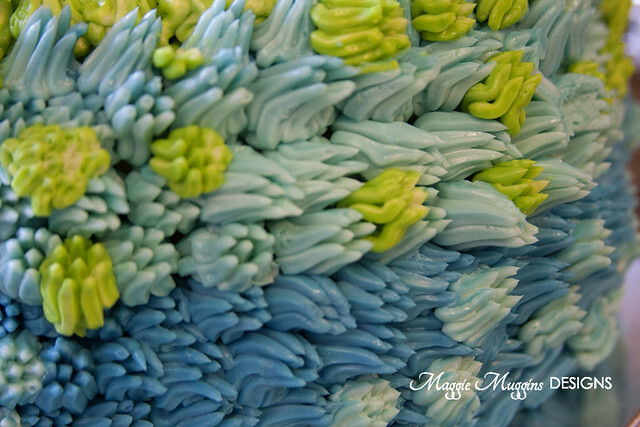 Here is my inspiration board on Pinterest. When I picked this up I nearly squealed in delight. It was simply stunning. 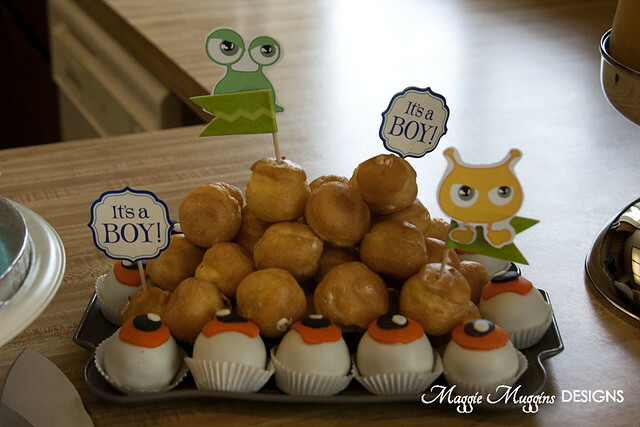 I also ordered a dozen cake balls of the eye balls to coordinate. My boys thought they were so cool! I will definitely be going back to them for birthday cakes. 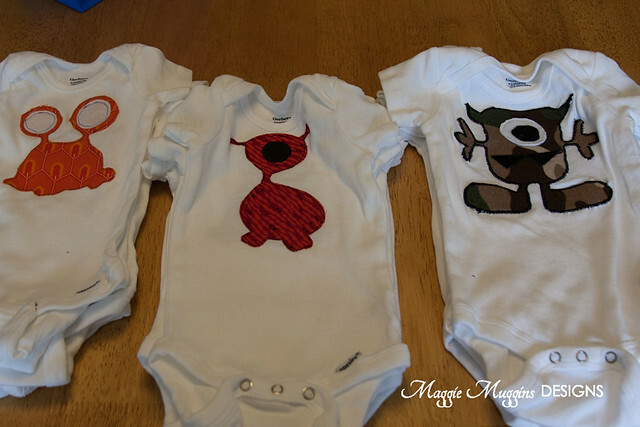 I had a back-up activity planned but I really hoped that everyone would be willing to help make onesies for the new baby. (I like to be prepared for all sorts of crowds.) I provided the fabrics, already prepped with Wonder Under and gave them a few different templates to cut out. Then we had at it. After the shower I did the sewing. It was so fun and they turned out so cute. My boys LOVE trains. My oldest son is even a self proclaimed "railfan". Yes there's a term for that. And yes my little guy knows and uses it. He learned it from one of the many books on trains he borrows from the library. I usually have to take him to the educational section where more advanced train books are. Train stories are no longer sufficient. 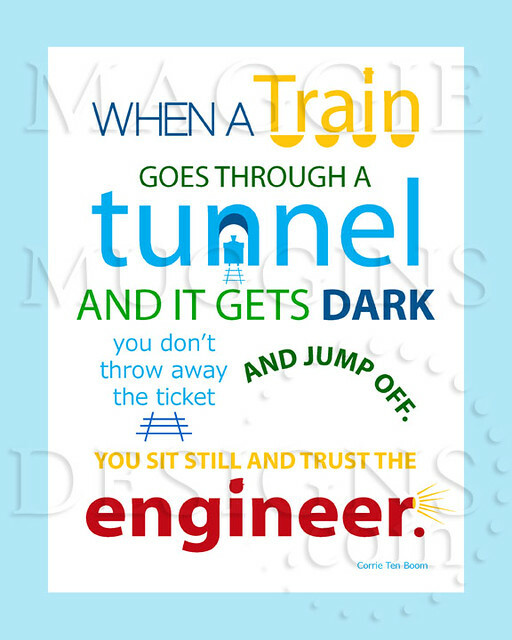 I decided I wanted to do a train themed quote in their toy room and went in search of quotes. Of course, I am also always searching for ways to better relate the scriptures and the gospel to things my children love and understand so when I found this quote from Corrie Ten Boom I was thrilled! What a profound reminder to us all - and a perfect way to teach my children that they need to trust in their Father in Heaven even when it seems impossible. 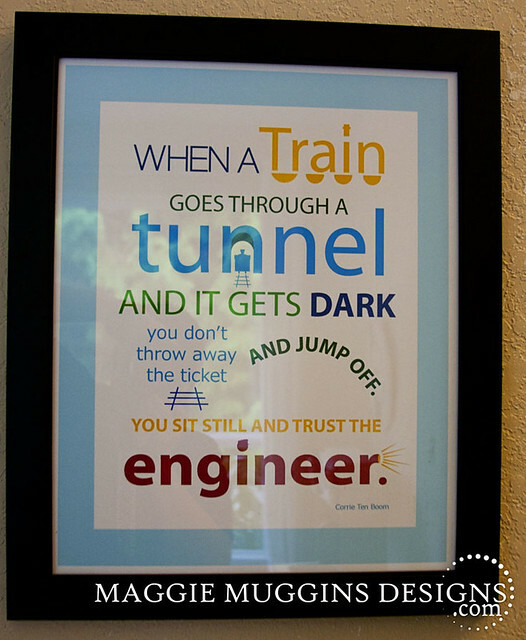 This was so fun to design but even more thrilling to see printed, framed and hung on the wall in the toy room! Eventually I will show you before and afters of the toy room. I just have to get to the after still! I am currently working on getting a shop up and should have the digital download of this available soon. I'll let you know once it is available. This was a 16x20" poster print from Costco Photo Center. They did a fabulous job (except I forgot to request NO border, but I still like it). 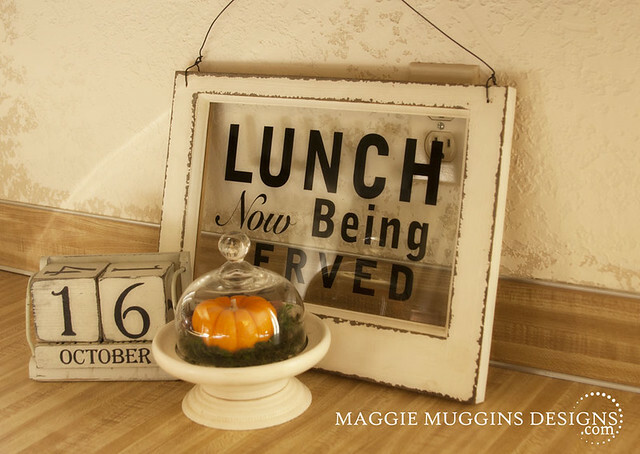 The frame I got on sale at Hobby Lobby.